Computer vision is a very interesting computer science field, and there are many ways one can apply it. There are powerful libraries such as OpenCV, Vuforia and many others that can perform computer vision tasks such as object tracking and shape or face recognition. These libraries are great if you need the most capable solution and you are prepared to spend a lot of time learning new things. While these libraries are most efficient, sometimes you need might want a simple solution that you can implement in 30 minutes. What makes iOS great is that there are loads of native frameworks that do magical things for us. One of these great frameworks is Core Image. It has many useful functions to work with pictures but we will use it’s face recognition function for the purpose of this article. Today I will show you the simplest way to recognize faces in live video. To spice things up we will add a beard, a mustache and a Santa hat to your face. The basis for this tutorial is taken from Apple’s example SquareCam. You can get the full project source code from Devbridge’s github repository. 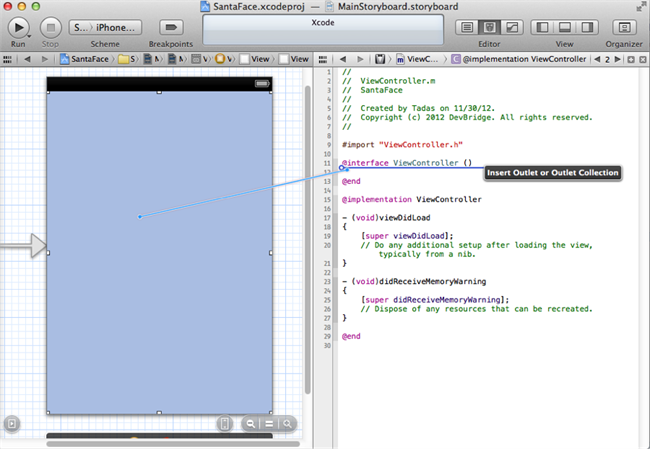 This example was written using Xcode 4.5.2 which you can download from the Mac App Store or Apple Developer website. 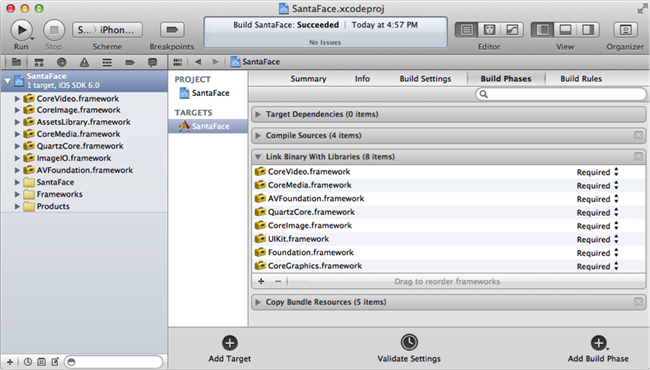 Because Core Image framework appeared in iOS5.0, you will need a device that is running iOS5.0 or later. Also, you need to be registered in the iOS Developer Program to run apps on your iDevice. This example does NOT work on a simulator as a simulator cannot simulate the camera. 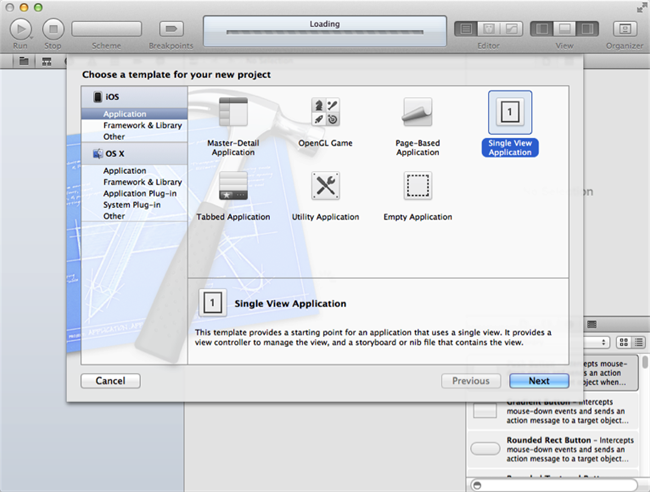 Create a new project and choose the “Single View Application” option. Because we want to make the application as simple as possible, we will disable rotation for it and presume that the user will always hold it in portrait mode. If you want to see how to implement face recognition for all orientations please look at Apple’s SquareCam example. Create a new file and name it DetectFace.  This class will recognize the faces, return face features and display video in UIView. We will need a layer to show video (previewLayer), view to display that layer (previewView), video data output instance to process the raw data (videoDataOutput), video data output queue to perform recognition without blocking the main thread (videoDataOutputQueue) and face detector instance to detect faces (faceDetector). First, set up an AVCapture session and set all options. We will be using the front camera with VGA quality (640x480). Next, lets implement the AVCaptureVideoDataOutputSampleBufferDelegate function captureOutput:didOutputSampleBuffer:fromConnection: in which we will extract the image from the buffer, pass it to the face recognition function featuresInImage:options: and then send features array to the controller, which has implemented DetectFaceDelegate. by the TIFF and EXIF specifications -- see enumeration of integer constants. The value specified where the origin (0,0) of the image is located. If not present, a value of 1 is assumed. used when calling featuresInImage: options: The value for this key is an integer NSNumber from 1..8 as found in kCGImagePropertyOrientation. int exifOrientation = 6; //   6  =  0th row is on the right, and 0th column is the top. Portrait mode. We also need functions to start and stop detection. Because we are recognizing faces in video we want our detector to be fast, so we will be using the Low Accuracy option. To pass face feature array to our view controller we will use a delegate. Please look at the source code for their implementation. After creating DetectFace open MainStoryboar.storyboard file and add UIView to your View Controller. Then open Assistance view and connect this new view to your controller (Select UIView and drag it to your controller while holding Ctrl). Name it previewView. As I have mentioned we will be adding a beard, a mustache, and a hat on the video feed so we need to have 3 image views. Also, create a DetectFace instance which will do the recognition for us. In viewDidLoad function initiate detectFaceController, set ViewController as it’s delegate, set previewView to display video from detectFaceController and start detection. The final step is to implement the DetectFace delegate function. In this function we check to see if image views already exist. If they don’t exist, we create them with the appropriate images and add them to video preview view. Then we take the coordinates of face features and position the beard, mustache and hat to match face features. This is a very simple example but it’s a good start to create something interesting. 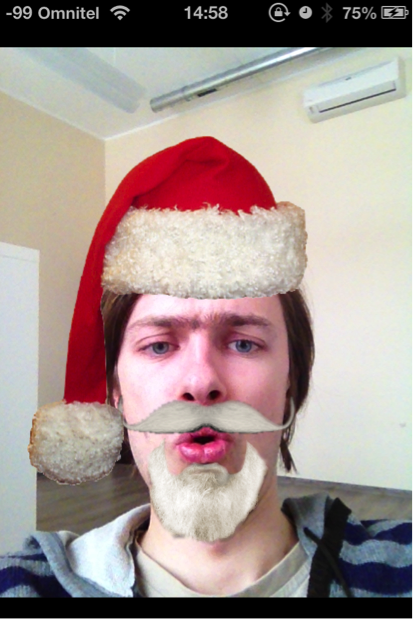 Please download the project from a public GitHub repository with all source code and images (https://github.com/devbridge/examples/tree/master/SantaFace-iOS). Have fun coding and have a nice holiday! Ho Ho Ho!